By a large majority, the Italian Chamber of Deputies has adopted legislation that criminalizes the denial of the Shoah. 340 deputies voted in favor, one against and 107 abstained. In future, people who promote, incite or commit acts of racial discrimination based in part or entirely on the denial of the Holocaust can be punished with prison sentences of up to five years. 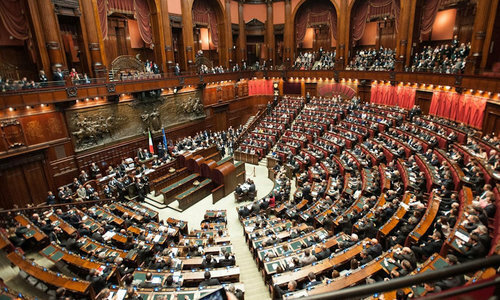 Although the upper house of Italy's parliament, the Senate, already backed the new law several months ago, it will now have to reconsider it as the Chamber introduced stiffer penalties in the bill. “This new law represents a significant step forward so that the Italian legal system can effectively prosecute professional haters and deniers, while preserving the inviolable right to freedom of research and opinion,” the president of the Union of Italian Jewish Communities (UCEI) Renzo Gattegna commented after the vote in the Chamber. Gattegna was invited to witness the debate and vote together with the president of the Jewish Community of Rome Ruth Dureghello, her deputy Ruben Della Rocca, member of UCEI board Victor Magiar and former president of local Community Riccardo Pacifici. The vote followed a three-hour debate among representatives of different political parties. Center-left and center-right lawmakers voted in favor, but populist parties such Five Star Movement and Lega Nord decided to abstain.Deputy Walter Verini, who presented the bill to the Chamber, expressed hope that the law become effective on 27 January 2016, International Holocaust Remembrance Day.